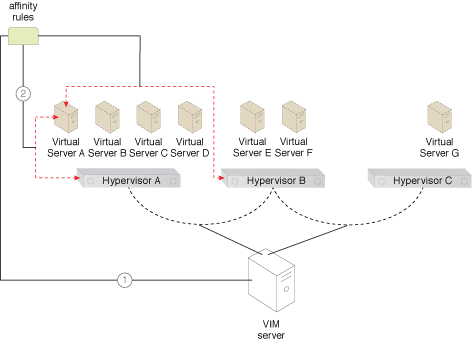 How can a virtual server be guaranteed to be hosted by a specific hypervisor? A virtual server needs to be hosted on a particular host. Affinity rules are used to ensure that the desired virtual server or workload is hosted on the target host. Affinity rules are applied and configured via the application of this pattern, and are dedicated and controlled by the VIM server. 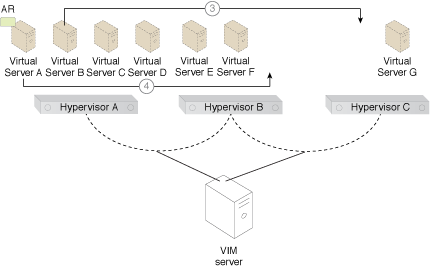 The steps involved in applying the Virtual Server-to-Host Affinity pattern are illustrated (Part I). The steps involved in applying this pattern are illustrated (Part II). The workload is balanced between the hypervisors. 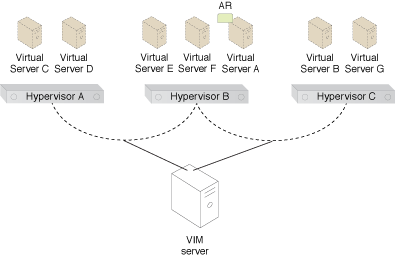 Virtual Server A does not have any contact with any hypervisors other than Hypervisors A and B (Part III).